A Federal high court in Ikoyi has revoked the bail it granted a former Governor of Abia State, Orji Uzor Kalu, in an alleged N7.5 billion fraud trial he is currently facing. The Presiding Judge, Mohammed Idris retracted the bail conditions granted to Kalu in 2007 and ordered that the EFCC should effect his arrest if he fails to submit himself to the anti-graft agency on arrival into the country. 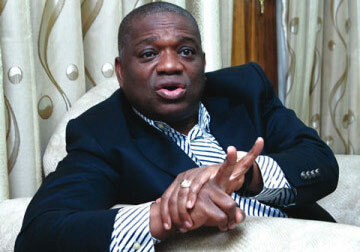 The Judge said; “I have perused the proceedings from court records and I discovered that one of the conditions for granting bail to the 1st defendant, who happens to be Orji Uzor Kalu, is that he should deposit his international passport with the court and the permission must be granted before he can travel outside the country for whatever reason. “It is clear that the 1st defendant has flouted this order. No one, high or low, rich or poor can disobey a valid order of court and expect such court to show mercy. The judge, however, accommodated the doctor’s report that claimed the embattled former governor should be admitted on bed rest for ten to twelve months. “In line with the neurosurgeon’s advice from Germany which stated that the 1st defendant should be on hospital bed rest between ten to twelve months, this case is adjourned to January 23rd, 2019 for trial,” the judge ruled. In September 2018, EFCC had urged the court to revoke the bail granted to the embattled governor. EFCC’s counsel, Rotimi Jacobs (SAN), said the former governor travelled out of the country without seeking permission from the court. Meantime, a group of elders from Abia State has commended the Federal High Court sitting in Lagos for revoking its earlier bail for former governor of Abia State,Orji Uzor Kalu in the N7.6 billion suit instituted against him by the Economic and Financial Crimes Commission ,EFCC. The group, Concerned Abia Leaders, reacting to the court action, through a press statement yesterday in Abuja,signed by its leader,Chief Ogbuagu Amadi, tasked the Economic and Financial Crimes Commission ,EFCC,to immediately arrest the former governor and arraign him in court. Besides, they said the circumstances that led to Kalu travelling outside the country in spite of his name being among those listed by the Presidency not to seek foreign trips, be thoroughly investigated. The statement claimed Kalu’s action was a clear indication that his aim of traveling abroad was not on medical attention as he had allegedly made the court to believe. “As we commend the Federal High Court Lagos for its landmark decision in revocating its earlier bail on our former governor, Chief Orji Uzor Kalu,we call on the EFCC to immediately effect his arrest and subsequently arraign him in court to face trial. “The Concerned Abia Leaders wishes to reinstate its earlier call on the presidency to launch a full-scale investigation into how Chief Kalu left the country despite being in the list of those placed travel band on by the presidency,”the statement said. Amadi in the statement said the group was a non partisan one as its members cut across all political parties in the country, saying it was only canvassing for good governance in the state.